Natalie Wright, Author: Judge this Book by the Cover - VOTE FOR YOUR FAVORITE & WIN! Judge this Book by the Cover - VOTE FOR YOUR FAVORITE & WIN! It's time to judge a book by the cover! Those of you who follow my blog know that I'm working on a science fiction novel, The Deep Beneath, the first in the H.A.L.F. Trilogy. I'm hoping to have it in the hands of readers in May (*crosses fingers*). My cover artist for this project, Derek Murphy, has created some draft covers. I don't know which concept to choose!? Can you help me decide? Please submit your vote in the comments below by stating whether your favorite is Option 1, Option 2 or Option 3. And let me know what you like and what you don't like about these design concepts. But wait! Why not make a contest out of it?! 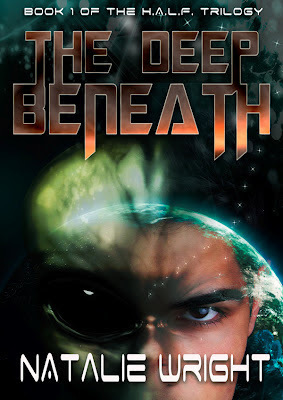 If you pick what ends up being the winning cover, you'll be entered into a drawing to win a signed ARC of The Deep Beneath! Rules & Fine Print for the Contest: In order to win, you must leave your e-mail address either in your comment OR sign up for my newsletter (at the very top of my blog on the right side). Winner will be picked at random from all those who voted for the winning cover. I like option 2 personally (assuming the book involves large elements of hidden, or not so hidden, aliens trying to take over the Earth). Alien human hybrids . . . I like #2 as well, BUT, if there is a YA type romance, the first would probably be better marketing choice. I like the colors on #2, though. Thanks for your comments Pauline. Good points. So, I prefer the man in Option 2, but the over all look of Option 1. Option 2 is much more aggressive overall, but the close up has a better "feel" for the alien/hybrid concept. My suggestion would be to somehow just use the face from Option 2 in an Option 1 like cover. Thanks for your thoughtful input Emma Lai.